So I knit him a sock! It’s been a while since I discussed knitting technique stuff, hasn’t it? Well, let’s talk just a little bit about short-row heels and toes, interesting bind-offs, and why faking is such a good thing ;). These are very special socks because they are for my dad. Of course! Dad socks are always special ;). Now, before you go thinking that this is some kind of belated Father’s Day gift, let me correct you – I promised these to him during a phone conversation on February 11th. So, they are technically a belated gift for Valentine’s Day, St. Patrick’s Day, April Fool’s Day, Daylight Savings Time Day, Passover, Easter Sunday, Earth Day… you get the idea. Another special thing about these socks is that they are extremely well-planned. Zero element of surprise. My dad, in so many words, told me that he wants light-colored socks, and that the black pair I knit for him out of Lorna’s Laces Shepherd Sock is the softest. Naturally, I went with LL SSock again, in the chino colorway. This is a very tasty color, like coffee with a lot of cream in it. Knowing that I hate brown and anything that even remotely resembles it, this is saying a lot. Last time I visited my parents, I showed my dad several sock pattern books, and while he could care less whether his socks are 3 x 1 ribbing or moss stitch, he kept remarking on ones with calf shaping, that it seemed like they wouldn’t bind at the calf. It quickly became apparent to me that calf shaping was the most important pattern element in his new pair of socks, and everything else was rather arbitrary. 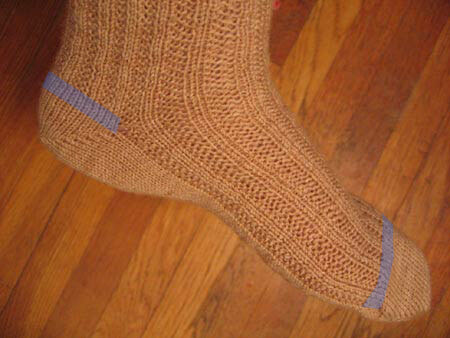 So, I went with something simple (and I hope manly enough) – the Garter Rib pattern from Sensational Knitted Socks. 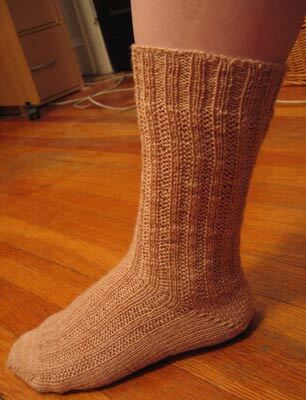 I knit this sock from the toe to the cuff, using a short-row heel and toe (I use Wendy’s method). The majority of the sock is worked over 60 sts on US 0 needles, but then generously increases to 68 sts for the calf. Sorry for the poor light, and also… damn, that thing needs blocking! 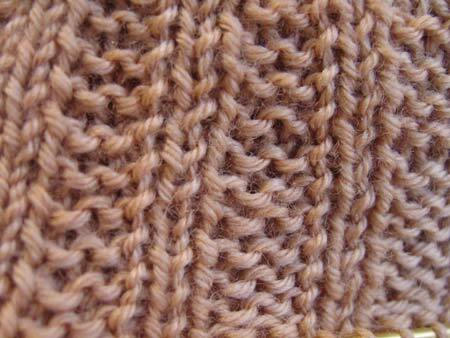 Every 6 rows, I increased 1 stitch in pattern on either side of the 2 sts that make up the center back. To finish, there is about 1.5″ of simple 2 x 2 ribbing to help them stay up, and a fancy lil’ bind-off. Work 2 sts in pattern (either knit or purl). Move yarn to back (if the last worked st was a knit, this is already the case). * Transfer the 2 worked sts to the LH needle, and k2togTBL. Work 1 st in pattern (move yarn to back if it was a purl), * repeat between *. Important note: I use a larger needle to do the bind-off. Here the sock is knit on a US 0, and I used a US 1.5 to do bind off. I learned this bind-off when knitting my mom’s Leaf Lace Shawl and have since used it on all socks I’ve knit toe-up. It’s very functional, I think. Definitely more stretchy than a standard bind-off, a lot easier to execute and frog than EZ’s sewn bind-off (aka, backstitch bind-off or cast-on bind-off), actually understandable (in contrast to the “modified conventional bind-off” in Lucy Neatby’s book, which always baffles me). The only competitors are the tubular bind-offs, which are quite neat and pretty, but for me not worth the trouble (see EZ’s sewn bind-off), and not stretchy enough (see standard bind-off). I want to share one more “tip,” if you will, with you. It applies only to patterned socks, not to stockinette ones (although perhaps you’ll find the information useful anyway). Two inches is the magic number. When working from the cuff down, you know how when you knit a heel flap, you work back and forth for 2″, then turn the heel, pick up stitches for the gussets, etc.? And when you reach the toes, you start shaping the toe 2″ before the desired sock length? Okay, sometimes it’s 2.25″ or 2.5″, but follow my argument for a moment. That number isn’t arbitrary. Two inches is the height of an average heel, and the length of an average set of toes. Give or take, of course – I have stunted 1.5″ long toes, for example. It is pleasing to see a distinct design element, like a heel flap or the little bit of fabric that covers the toes, which matches in size and shape the actual part of the body it covers… Like making sure that the empire waist of a women’s blouse actually lands where it’s supposed to be. If it’s not quite in the right place, it looks rather disturbing even if it functions fine. When working short-row heels and toes, or at least when I work short-row heels and toes, I find that they come out to be about 1.5″ deep. If I made them more pointy, as some people like to do, they’d probably be a little deeper, but I don’t think they’ll ever make it to 2″. And I’ve realized that although patterned knitted fabric functions just as well as its simpler stockinette cousin, it looks kind of awkward when the knitted heel element worked using short rows doesn’t cover the whole heel, anatomically-speaking. So, I’ve recently gotten into the habit of making my short-row heels and toes appear longer. When working from the toe-up, after completing the short-row toe, I work another 6-8 rows (1 cm) of stockinette in the round, and only then start the pattern. As a result, the little stockinette toe cap fully covers the little toes! Similarly, after turning the heel, I will work 1 cm of stockinette above it before starting the pattern. It’s just a visual trick, but I think it works! Blue showcases the “fake” bits. Thanks for the sock tips. I’ve been resisting the toe up method but having short toes myself and being anxious to try a new sock for which I have limited yarn, this is just the inspiration I need! The info about adding an extra bit of toe and heel is very helpful. I’ve just been making my first set of socks and I noticed that they were about 1.5 inches in those spots as well rather than two-which is just fine for my toes (I have small feet), but not so great for my heels. Being a sock- novice-kind-of-person, it is nice to see a couple of tips every so often. By the way, I plan on making the Jaywalkers after I finish my first set of socks. Your pattern was the first one I wanted to try, but I thought I had better stick to something simple the first time around. I’ve made socks with the pattern down the foot, and the pattern stopped short of the toes, leaving what looked like a very long toe. I didn’t mind too much, but I know what you mean. Cari at “January One” does one row of purl stiches to mark the beginning. Simple yet effective. Good tips on binding off-thank you. My next socks I plan on knitting toe up. A pair I received once were bound off too tightly and I had to fix them. Literally couldn’t pull them on. Newbie here, and thanks for the tips! I am compiling massive amounts of sock knitting info for the day when I finally conquer my fear of the socks. Which is soon… I think. Can you please share what short row heel method you use? I’ve tried a couple methods (Wrap and YO) and not had success. The wrap ones looked different on each side of the heel and the YO ones were loose on one side and tight on the other. I’m trying YO one more time, being conscious of keeping my YOs tight…but I’m all ears for other methods. And I’m still trying to figure out why I couldn’t get the wrap method to work. What a great idea – I always avoid short row heels because I think they look funny. How did it never occur to me to just “add on” – duh! Thanks!! Lady, you are singing my song! After I did the Leaf Lace Shawl and used that cast-off, I started using it for all my toe-up socks. Like you said, it’s much faster than the sewn cast-off and is very stretchy. For some reason, the thought of falsies on my short-row heels and toes just made me smile. Ah yes…I too am knitting socks for dad…quite a long adventure. Calf shaping is a must here as well. They definitely don’t want the sock to strangle them. I too knit extra rows in st st at the toe and heel….hmmm…great minds. Smart! I’m going to try your bind off on my next pair of toe ups. I’ve been using the sewn bind off, but find that my results are too inconsistant to please me. i do the same thing with my short rows heels. i do a wedge toe but increase faster than normal, and therefore add in some non-increased length as well. it just looks better. as for the bindoff, i recently came across its name and damnit, i can’t remember what it was. i think it was the name of a city. yeah, that’s helpful. anyway, i don’t know why that bindoff doesn’t get more attention. it’s damn nice and simple. Excellent tips. I knit a pair of socks for DH using that pattern. They looked great, so I am sure your dad will be happy with the pattern. Interesting Grumperina. Must take note of that. I’m sure he’ll be delighted with the new socks! Grumperina, I am using Wendy’s toe up pattern for my current pair of socks, but I’m sure I’m picking up the wrapped stitches wrong. They seem tight. Do you have any resources that helped you? i’m a big fan of that bind off too and definitely learned it from the fibertrends shawl pattern! wooh! Thank you for this bind-off for toe-up socks. I have two pair on the needles at the bind-off stage. I am going to use this method that is new to me. I also do the little bit of extra stockinette after short-row heels and toes like you do. Thanks for this post! Lots of very useful info. Very cool. It’s amazing how 1 cm of stitching can make such a visible difference. Thanks great information. You left out the most important information however. Has dad washed the black socks yet? Cause I’m worried for your mom if he hasn’t. In Simple Socks Plain & Fancy, Priscilla Gibson-Roberts calls these “ankle rows”, and suggests that the ankle rows should equal 20% of the stitches cast on. Great minds obviously think alike. I like the sound of that cast off … I shall have to try it, as I’ve been using tubular cast-off, and find it a bit fussy and not stretchy enough, although I like the way it looks. Thanks for the new bind off info. Very neat! I work most socks toe up and this one will probably jump to the top of the list. My youngest DD has the same size foot as mine but her ankles are very thick so when I make socks for her with shaped heels (she prefers tube socks) I do make a short row heel but I also add a short flap – about 8 rows to pick up 4-5 sts and work the decreses after the ankle. THANK YOU! for your comments on short row toes and heels. That is exactly what has been bothering me about them (subliminally). I am going to try that next time. Clever girl! And many thanks for sharing those tips 🙂 I’m sure they’ll come in handy. Is your dad thrilled with his new, stylin’ hosiery? What a great post! I can’t tell you how many little gems I took from that post! I am planning to bust my stash of sock yarn this summer and now I have some great new techniques to try! Thanks! Very clever! I’m about to knit my first pair of toe up socks and am excited to used your fakery. What great tips, Grumperina! I use Wendy’s toe-up pattern, too. I checked the current sock in progress and I did the same thing to the toe, adding on stockinette rows after the shaping. I wasn’t thinking about how the length would look, though; I’m using self-patternng yarn and I just wanted to start the pattern (a simple K2P2 rib) on a good color. I’ll have to try the heel add-on when I get there, too. And I will definitely try the sock bind-off. Thanks so much! Thank you for the sock tips! I believe most of men socks should be shaped, they seem to have bigger calves and I would pressume that regular tube socks would be a bit uncomfortable. Your Dad is going to love these :). Oooh, I’m going to have to try that bindoff on my next pair of socks! And I love the visual trick. I’ll be incorporating that too. Thanks for the tips, lady! I am also knitting socks for my dad (size 11.5 feet, sigh). Carolyn over at Greenwood Fiberworks very kindly agreed to sell me two blanks of her cotton/lycra sock yarn for my dad’s plain vanilla socks. (why do men only want socks in “colors” destined to make us go insane while knitting them?) They’re knitting up very nicely on size 2s if you ever decide to knit a very large pair out of that yarn. I’m going to knit toe up Jaywalkers with a turkish cast-on and short row heels next. I can’t wait to use the bind off on that too. I have very short toes, so I leave the toes alone, but I “borrow” a few sts on each side for the heel and also work back and forth once at the beginning before starting the short rows, and correspondingly once at the end. I can’t remember if I read this anywhere or just unvented it out of a desire for deeper heels. Day late…but I couldn’t help but join a sock discussion especially as I finished my Jaywalkers out of Cherry Tree Hill (as it’s warm I just look and fondle, though I don’t smell them). Now I’m working on Odessa meets Mata Hari socks. Here are my tricks (give credit to EZ and L. Neatby): to cast on I use long tail method @ 3x top circumference + 6″; the heel width is ~60% of the circumference–work with your pattern; short row for 2/3 of that for heel (in stockingette, 1/3 each “side”); short row for toe similarly but divide in half first (I don’t mind sock amounts of grafting because it’s so cool to watch it come together–you need a length twice the width of your graft + 2-6″). Granted, I will sometimes cheat with a bit of stockingette before the toe so grafting is easier. So I amuse myself with math (best done in the head to keep the neurons happy) as I anticipate my knitting. Thanks for your tips. 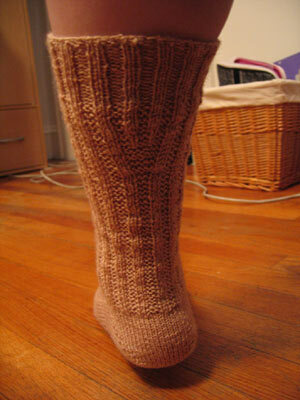 I just finished a pair of garter rib socks using the pattern (formula?) in Sensational Knitted Socks. I Love this book – it’s improved my understanding of sock knitting 1000%. Your socks look great. I also use a little stockinette extension above the heel flap, but I don’t think it’s entirely cosmetic; patterned legs that don’t have this feel to me like they’re getting sucked down into my shoes, even when they’re actually not. I’ve noted that on commercial socks which have ribbing or other patterns on the leg but not continuing down across the instep, they also stop the pattern around 1/2″ to 1″ before the heel.